Rewind to Issue #102 of Singletrack Magazine for Tom Hill’s review of the Praxis Works wide range cassette. 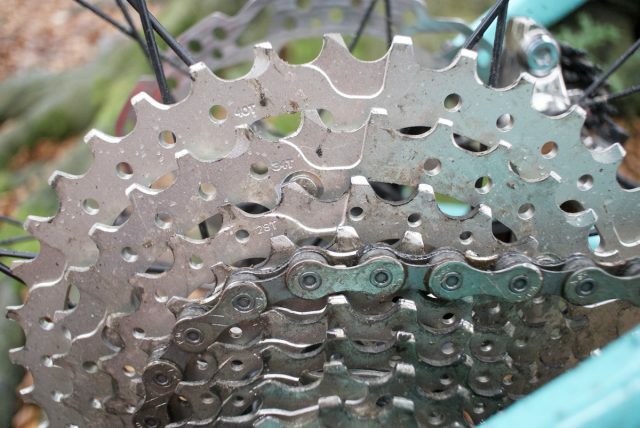 Wide range cassettes were once the preserve of top-of-the-range 11-speed groupsets. Usually in conjunction with a single ring at the front, they offered an almost equivalent range of gears in comparison to ‘two-by‘ set-ups, but without the weight or complexity of a front mech and shifter. 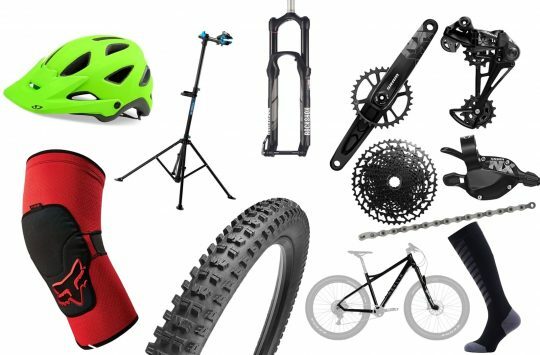 It wasn’t long before a few enterprising companies turned their CNC machines to producing expander cogs, allowing those of us with more modest budgets to convert our 10-speed set-ups to allow for a 40T or even 42T climbing gear. The Praxis Works cassette is designed for 1×10 drivetrains. It was one of those inventions I didn’t realise I wanted or needed until I tried it, happy as I was to heave and grind away with a 36T or even 34T gear on my single-ring builds. Once fitted, I really appreciated the easier gear, especially for prolonged climbing. And a quick scan of the trail centre car park or race paddocks from 24hr endurance to enduro confirms that I’m by no means the only convert out there. With an 11-40t ratio, this guy offers a lower climbing gear than comparable SRAM and Shimano 10-speed cassettes. 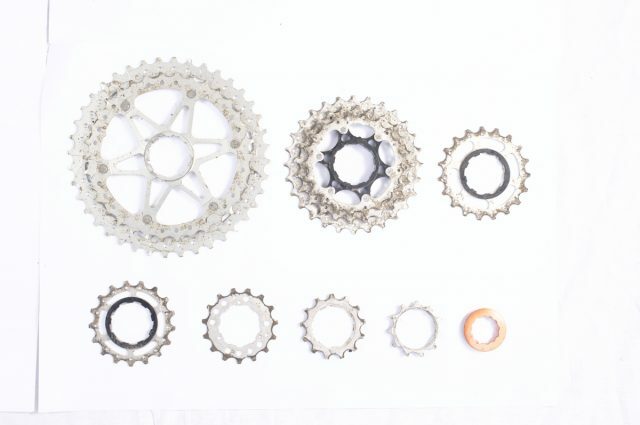 In order to make space for your new XL cog, most set-ups require removal of another sprocket to make room – usually a 17T or similar lower down the cassette. This can create awkward gaps in the gear range. Again, those enterprising companies have taken to manufacturing other sprockets, to try to even out the gaps, but surely there is an easier way? Praxis Works have built the largest 3 sprockets from alloy, while the rest are steel. Step forward Praxis with their all-in-one solution. Their 11-13-15-17-19-21-24-28-34-40 cassette looks otherwise identical to a mid-range Shimano or SRAM cassette, except for that dinner plate sitting at the back. With a long-cage Deore rear mech, it was a straight swap for the old cassette so I didn’t even need to adjust the B-tension screw. Praxis says the cassette requires no further rigging or adapters – in my experience this was true. Running through the gears in the stand, the Praxis didn’t feel quite as smooth as the Shimano it replaced. This wasn’t duplicated while riding, though; shifting was as crisp as I would expect. In fact, I simply forgot it was fitted, until I reached a steep climb – at which point the 40T was engaged, and I twiddled my way up. More importantly, when in the gears I more frequently use – the 15T, 17T and 19T, I never felt like I was gawkily flipping around trying to find the right ratio. 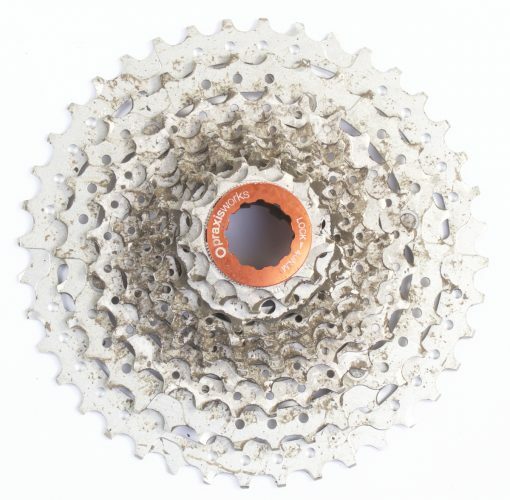 Weight-wise, the Praxis Works 10-speed cassette comes in at 322 grams. At £105, the Praxis is significantly more than a 10-speed XT cassette, but add in the cost of an expander cog, and maybe a 16T sprocket to even out the ratios, and prices are pretty much equivalent. Weight-wise, at 322g (claimed, and backed up by the Kitchen Scales of Truth), it comes in around the same weight as an unadorned XT cassette, so will shed some grams in comparison to a converted one. I haven’t noticed wear to be any better or worse than any other cassette, even as we move into a wet and filthy late autumn. 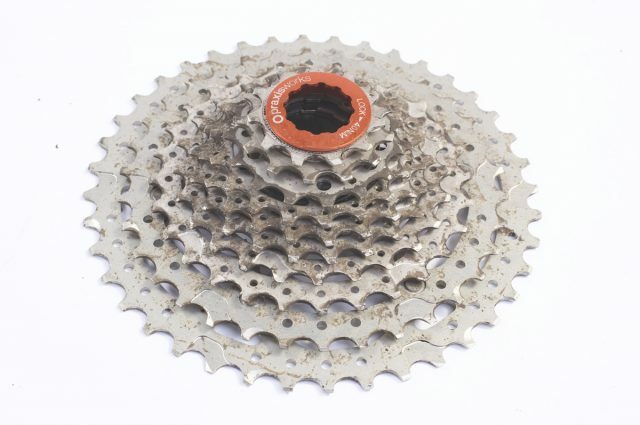 Rather than using an expander cog, the Praxis Works cassette delivers a purpose built ratio for the 11-40t spread. I do wonder whether the trickle-down effect will mean 11-speed will become a cheaper option for many by this time next year, but in the meantime, the Praxis is an excellent option. The gaps get bigger towards the lowest gears, so shifting isn’t quite as smooth as a comparable Shimano XT 11-36t cassette, but it’s damn close. Not ready to move to 11-speed? 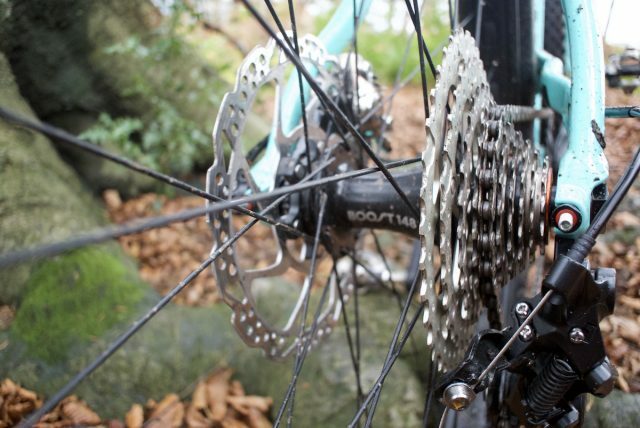 A flawlessly functioning solution to wide and well spaced gear ratios for 10-speed set-ups. Assuming your current cassette is worn out, then it is also good value. Problem with the sunrace one is that it has large gaps in the mid range ratios, pretty much the same as you get swapping the 17 for an expander. 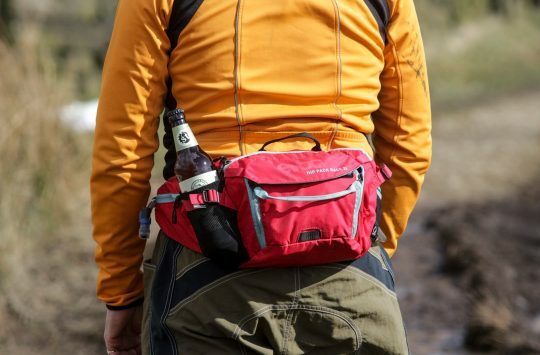 I’m afraid Tom hasn’t been riding hard enough. I bought this cassette and it was junk after 3 months. I put a new chain on with the cassette and changed it at 0.75% stretch, and the new chain slipped on the 34t and 40t cogs. I changed to the sunrace cassette and have had three times the life and it’s still going. Also I prefer the sunrace ratios, with nice 3t steps at the high end, for shifting up going downhill, and closer ratios at the bottom for steadier climbing (this is for a mountain bike, not a road bike). I’ve just changed the chain at 0.75 wear on my 1 by 10 setup using the Sunrace 11-42 cassette, I was half expecting to have problems with the new chain but it’s been fine, no slipping or grinding at all. My experience with the Praxis Works cassette mirrors Toms. 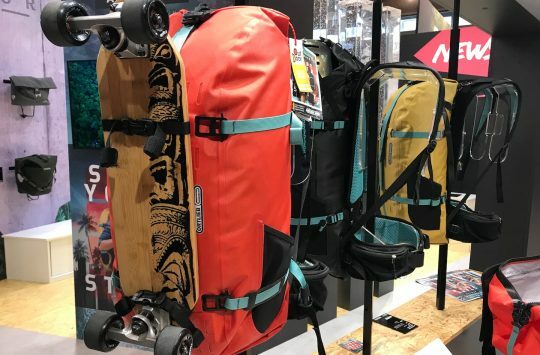 I tested one back in Australia for 7 months, and had no issues with shifting or chain slipping. 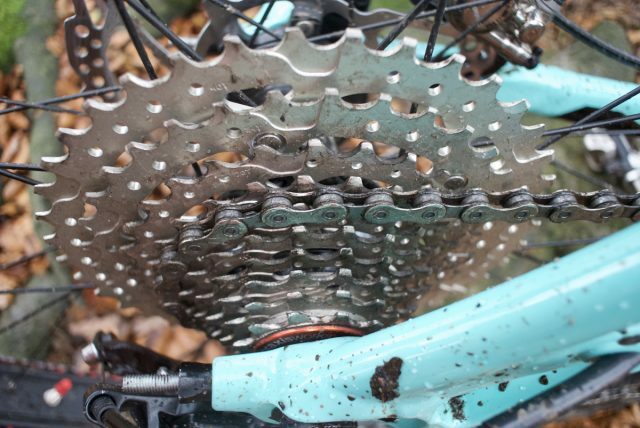 There’s no doubt that shifting isn’t quite up to par with a Shimano 11-36t cassette, but it’s pretty close, and it’s a helluva lot smoother than using a regular cassette that’s boosted with an expander cog. For those with 1×10 drivetrains, I personally think it’s a no-brainer upgrade for accessing lower gear ratios without changing out multiple drivetrain components. I guess in fact Tom is so hard he always climbs in the 28 cog. I mainly used the 34 and it soon looked nowhere near as pristine as the one in the pics above. Been running one since I read the original review, & it has been great. Lots of miles, no issues.